The inevitable is beginning to happen! At least, we now have an idea as to who will sweep the Chaguanas West election… Interestingly, a new poll has shown that Jack Warner has garnered a massive 48% of approval ratings for the July 29 bye-election. It is a reflection of the man’s charisma and genuine concern and commitment for his people. United National Congress (UNC) candidate Khadijah Ameen is languishing with 23 per cent rating and the People’s National Movement (PNM) candidate Avinash Singh has three per cent. This is a clear sign of things to come! The biggest reason for Jack Warner’s lead in the approval ratings is his personal charm, with a favourability rating of 74 per cent. Even among the undecided voters, his favourability is at 62 per cent. This goes to show that the people of the Chaguanas West constituency have declared their stand and are already in a celebratory mood. Mr Warner’s personal appeal has translated into the creation of a new political force, ILP, which is effectively competing head-on against the UNC brand. I think UNC’s days are numbered! It is really amusing that at least 6 percent of the voters do not even recognise the name of UNC candidate Khadijah Ameen! Polls show that even among those who are thinking of voting for her, 13 per cent had no opinion of her. In effect, she is basically a non-entity! PNM’s candidate Avinash Singh should pull out of the elections and save some face. He is at the bottom of the ladder with a meagre 3 percent approval rating. The poll observed that he is not even guaranteed to win majority support among even traditional PNM supporters, many of whom plan to vote for Jack Warner. It may very well be a sweep for Mr Warner. The UNC is trying to bring the issue of race into the Chaguanas by-election and destroy the unity of the community. UNC’s Housing Minister, Dr Roodal Moonilal is trying to divide the people in order to score cheap political points by bringing race into the politics. It is a shameful act and we the people can look through his tactics. It is in bad taste that anyone would try to divide Chaguanas West along racial lines! Prime Minister Kamla Persad-Bissesser probably does not realise in the heat of the election campaigning, but she should take a step back and realise that she is contradicting herself blatantly. After defending Mr Jack Warner and admitting to the whole world that he is her hardest working MP, when Mr Warner was part of the Government, she has now reversed her opinions to fight an election. That’s just petty, isn’t it? In my humble opinion, the Prime Minister now sounds like the Opposition Leader Dr Keith Rowley. Prime Minister Kamla Persad-Bissesser’s composure appears to be less than self-assured and in some cases her appeals to the residents of Chaguanas West seem desperate. Imagine the UNC campaign taking on the position that Jack Warner is attacking Ms Khadijah Ameen because she is a woman! I think that position is highly unfortunate, petty, shameful and irrelevant. It sounds like an appeal for a sympathetic vote rather than seeking the same on the basis of merit. This Prime Minister’s intent has been exposed and she may not have even realised. It very clear now that Mrs Kamla Persad-Bissesser can shamelessly lower herself to any level to make sure that she and her party remain at the helm of affairs. Last Friday, in her animated speech, she threatened the Chaguanas West constituents and she was not even subtle. She stated that if the people voted Mr Jack Warner to power, they will not get any benefits. Prime Minister made these statements with cameras filming and on a public address system that was recorded and televised. For someone who is flying high and riding on the wave of popularity to be threatened is a standard occurrence. 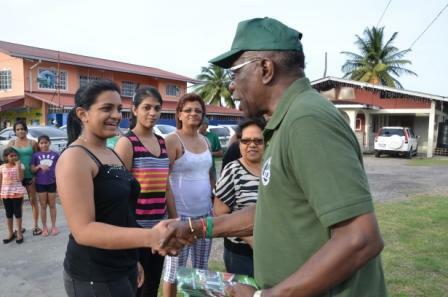 No wonder, a threat on life has been made against Jack Warner, who has proved to be the darling of the constituents. This is a sorry state of affairs and whoever is stooping down to this level will sooner rather than later be exposed! Mr Warner has already filed a complaint with the police and necessary precautions have been taken in this direction. But Mr Warner is a brave man and will not live in a cocoon. He will come out and do what he needs to do and get bogged down by any impending danger. We wish him all the best and hope that he is safe to lead the people of Chaguanas West. This entry was posted in News, Politics and tagged football executive, Jack Warner, politician.